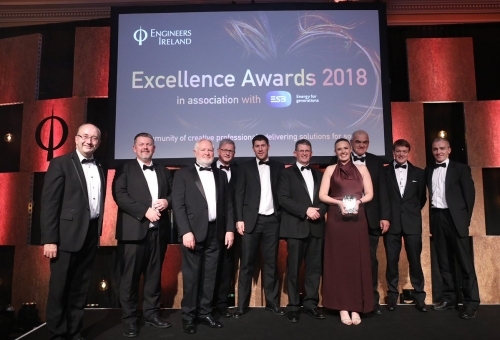 Geoscience Ireland (GI) members scooped awards at the ninth Engineers Ireland Excellence Awards. 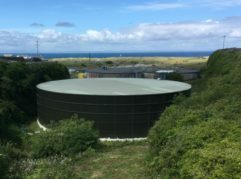 The Kerry Central Regional Water Supply Scheme by Irish Water, in association with TOBIN Consulting Engineers, Nicholas O’Dwyer and Glan Agua picked up the award for Engineering Project of the Year. GI, the business cluster supported by Geological Survey Ireland and Enterprise Ireland, sponsors the Geoscience Ireland Award which recognises exceptional achievement in design and/or delivery of projects requiring significant geo-scientific expertise e.g. 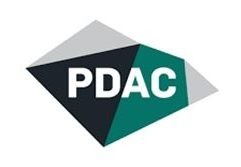 involving geological, geochemical, geophysical, geotechnical or hydrogeological studies or projects in the development of natural resources, infrastructure and water services in international markets. The Award, now in its fourth year, was awarded to the Northern Spire Bridge project team which comprised Roughan and O’Donovan, Farrans Victor Buyck Joint Venture, Quinn Piling, and Fugro-Loadtest. This project, in Sunderland, UK, is one of England’s biggest civil engineering projects in recent years. The 336m long cable-stay bridge comprises a 24m-wide deck, supported by a 1,550 tonne, 105m – high A-frame pylon. 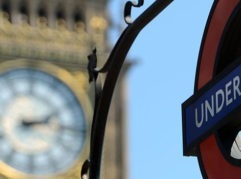 Through innovative design and construction solutions complex environmental and geotechnical challenges were addressed. TOBIN Consulting Engineers also won an award in association with Architectural Conservation Professionals (ACP) in the Heritage and Conservation category for their services in the Aran Sweater Market project. Other GI members shortlisted included; Julie Clarke, Gavin & Doherty Geosolutions (Chartered Engineer of the Year), Verde Environmental, JB Barry (Barry Transportation) and Gavin & Doherty Geosolutions (Geoscience Ireland Award). Also shortlisted for the Geoscience Ireland Award was The National CFRAM Programme by The Office of Public Works. 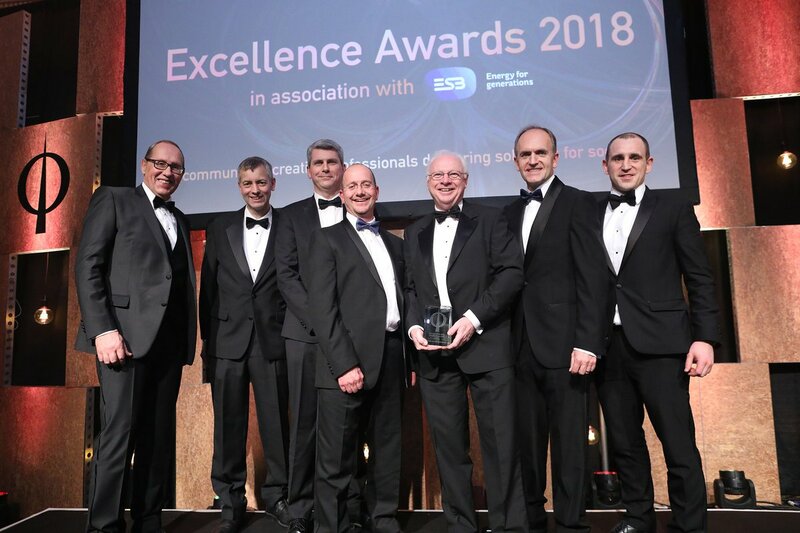 GI works closely with Enterprise Ireland (EI) in growing Irish companies and assisting them in winning business overseas; EI sponsored the CPD Employer of the Year Award which was won by Lufthansa Technik Turbine Shannon. The chairman of ARUP Ireland, Eoghan Lynch was awarded the ESB Outstanding Contribution to Engineering Award. 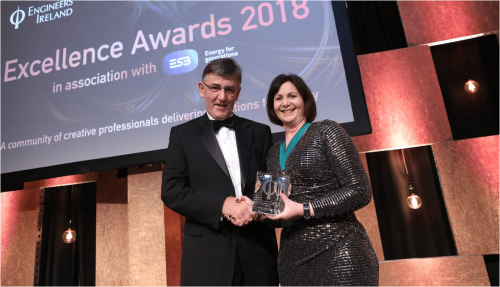 “Geoscience Ireland is delighted to sponsor one of Engineers Ireland’s prestigious awards for exceptional achievement in projects requiring geo-scientific expertise in the development of natural resources, infrastructure and water services. The judging panel was particularly impressed by the geoscience entries this year and while the Northern Spire Bridge project was the winner, the Ballygaddy Bridge Karst Treatment by Barry Transportation was a very close second”.